This list is in no particular order, but we hope to have these completed soon. Our goal is to publish at least once every week- stay tuned! Coming Soon: Where Are We Going? Upcoming trips and destinations we’re planning to visit in the coming months. Looking for an easy way to keep up with our latest posts? Our monthly newsletter is for you! Each month we send one email that includes our recent posts, updates on trips we’re planning, a few interesting links from around the web, and more. 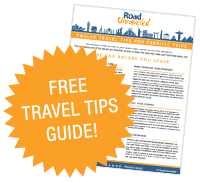 Subscribe today and we’ll send you our Twelve Travel Tips for Terrific Trips guide for FREE!